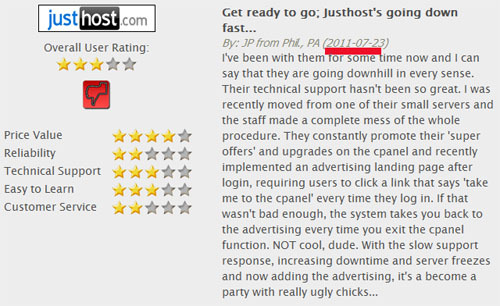 Going through my pending and spam comments I found thebest10webhosting.com. I was in the middle of doing some long overdue maintenance. So I figured I would try and check and make sure there was nothing valid in the spam folder. When a comment came in from this so called review site. At the same time I am trying to answer everyone’s email/comments. Some of which I have trouble answering and/or approving because in some cases like this they choose to do commenting that did not add to the discussion, but rather to their own benefit even it has nothing to do with the topic. This is the first of a few posts I want to do to explain what I deem as inappropriate. In this case web sites trying to advertise their services at my expense. 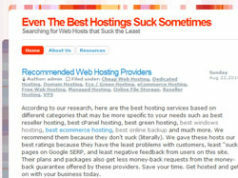 I will shortly explain why I choose thebest10webhosting.com to be my example. 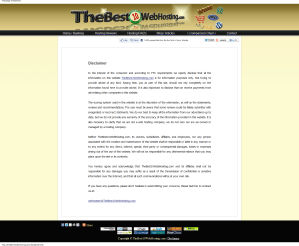 There is nothing special about thebest10webhosting.com. Remember when it comes to an Alexa score you want a low number. This high a number generally means visitors are rare. Despite having more Facebook fans then me, they have far less feedback then I would expect from a site with so many Followers on Facebook. You would think on average they would have more reviews then Facebook fans. They have not even been online for a year, but from what archive.org shows they did start the site the same month they bought the domain. So why am I even bothering going after thebest10webhosting.com? In terms of a post that will bring me in traffic this is not one of them. It may very well go down to be my least viewed post. In general I don’t bother with hosts that have an Alexa score above 1,000,000 after having dealt with the hosts that purchased fake positions at webhostingstuff.com. I only did that because I wanted to prove that these hosts were paying for a position in the top 25. For review sites I don’t bother with them unless they are below 500,000. That does not mean just because your Alexa score was too high that I completely forgot about them. For some that I have potential I have on a list for re-review at a later date. But as I stated I wanted to work on a post that deals with comments; in this case hosts, sites that sell services to websites (Like Mindshark.ca), and review sites that choose to spam in one form or another. 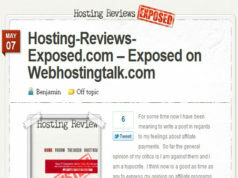 This review site that had the unlucky timing to spam my blog Tuesday is thebest10webhosting.com . Which happens to come in at a time when I need an example of what happens when you spam me. At the same time it serves as one of many so called consumer watch dogs or in other words top 10 sites. Though I guess you could have figured that out by the long domain name. This so called review site tried to chime in on a post I made about inmotion, it did not really add anything to conversation. But they defiantly tried to get their link in there. After all how best to get a big payout then to go to a site that has a post about one of the companies that they are trying to convince people is a good company. Because of this review site I decided to review webhostinghub.com and inmotionhosting.com to see if they had an FTC compliance clause in their Affiliate Agreement. Turns out every one of the hosts on this top 10 list do. This post is pretty much to point out why companies should not bother doing fake comments on my site or spam me to promote their own company. I will make it a point to make my own traffic from their name. Just as I will do with any company that tries to spam me be in via email, YouTube, comments on this blog, or whatever else. Which means I will look for every flaw that I can find about their site. Another problem is if people look up your site through an internet search they will find my site. So instead of making traffic off my work, I make traffic off thier work. They are another of these so called top 10 sites, who allow comments/reviews (maybe). I have a very good reason for believing that their reviews are fake. 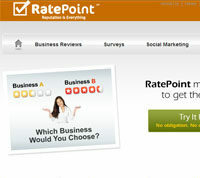 After all how can a site get a review before they were up? Remember the creation date for their domain is August 6, 2011, yet this review as done July 23, 2011. On top of that most of the comments are between September and October 2011 in no particular random order. 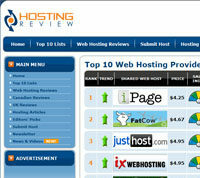 So which of the top 10 hosts that appears on the list does thebest10webhosting.com host with? That’s right, not a single one of these hosts. They host with Godaddy. Honestly compared to many of the hosts that appear on list I can tell you why. While Godaddy does have an affiliate program it does not payout near as much for the same package as most of these companies. The interesting thing is thebest10webhosting.com has not gotten the memo that HostClear.com is merging with JustHost.com. Well they do have a disclaimer, which I copied and pasted below. Please keep in mind that text in italics and red is not my grammar or spelling. Clearly doing very little to state they get paid by this top 10 list, but they do in great length say they are not liable. In the interest of the consumer and according to FTC requirements we openly disclose that all the information on this website TheBest10WebHosting.com is for information purposes only. Not trying to provide advise of any kind. Saying that, you as user of this site, should not rely completely on the information found here to provide advise. It is also important to disclose that we receive payments from advertising other companies in this website. The scoring system used in this website is at the discretion of the webmaster, as well as the statements, reviews and recommendations. The user must be aware that some reviews could be falsely submitter with exagerated or incorrect statments. We do our best to keep all the information from our advertisers up to date, but we do not provide any warranty of the accuracy of the information provided in this website. It is also necesary to clarify that we are not a web hosting company, we do not own nor are we owned or managed by a hosting company. 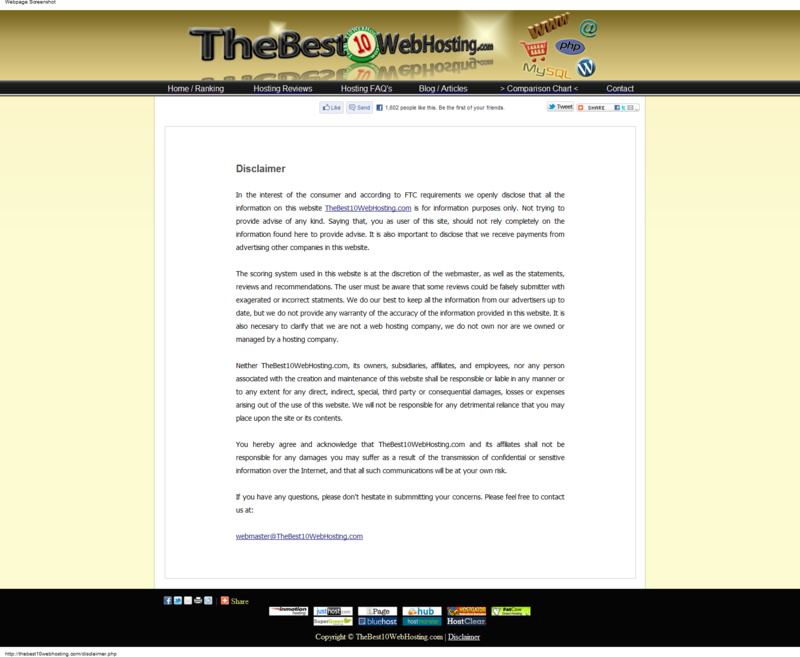 Neither TheBest10WebHosting.com, its owners, subsidiaries, affiliates, and employees, nor any person associated with the creation and maintenance of this website shall be responsible or liable in any manner or to any extent for any direct, indirect, special, third party or consequential damages, losses or expenses arising out of the use of this website. We will not be responsible for any detrimental reliance that you may place upon the site or its contents. You hereby agree and acknowledge that TheBest10WebHosting.com and its affiliates shall not be responsible for any damages you may suffer as a result of the transmission of confidential or sensitive information over the Internet, and that all such communications will be at your own risk. While thebest10webhosting.com has a page stating that they get paid (very short) this violates many of the hosts FTC compliance measures. 1. You have to scroll down and click to find and read the disclosure. 2. Its not on the same pages as the endorsements. 3. 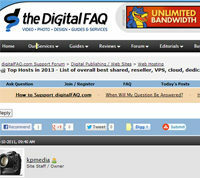 Its not clear that thebest10webhosting.com is being paid by these “top” hosts. So that means I will be contacting every Endurance International Group host, Hostgator.com, and other hosting groups that appear on this top 10 to advise them that their affiliate is non-compliant. Hopefully I do not add too much traffic to thebest10webhosting.